Austerity-to-prosperity lie based on "bogus math"
Republicans are committed to the belief that the only way out of the economic crisis is through austerity for the people. Clearly many Democrats as well buy into this profits-before-people policy. Austerity policies are being rejected in Europe and everywhere working people have the means and will to fight back. In the United States, the majority of the voters rejected the austerity platform of the GOP in 2008 and 2012, but the idea has still not gone away. Austerity is aimed at the working class not the wealthy who are making record profits. Let’s be clear: it was not the unions, seniors, immigrants, children, black, brown and white workers, or the disabled who brought this country to its knees. It was finance capital, and that’s who has the means to pay for the crisis. Forcing them to do so is the challenge all democratic and progressive forces face. There is currently a new scandal on the extreme right on this question. In 2010 Harvard economists Carmen Reinhart and Kenneth Rogoff coauthored a paper entitled, “Growth in a Time of Debt.” Right-wing politicians all over the world have used their theories as “proof” that slashing government spending and other austerity measures is the path to prosperity. The Reinhart/Rogoff paper is considered the most politically influential economics paper of the last decade. GOP Congressman Paul Ryan and Treasury Secretary Tim Geithner have both cited “Growth in a Time of Debt” to justify the most vicious attacks on public workers and government social spending. Recently, a graduate student at University of Massachusetts, Amherst, Thomas Herndon requested a copy of the data used in the paper and found that some basic figures were left out that disproved the theory that government debt prevents economic growth. Thus the basic arguments used by the Republicans to fire massive numbers of unionized public workers, to deny needed government created jobs, push for privatization and destroy Social Security are based on what has been shown to be bogus math. Austerity policies, in addition to being wrong headed, have a sharp racist edge. The black and brown Americans with the highest rates of unemployment and poverty will be the most affected by the cutbacks. Thus fighting austerity means fighting racism. It means fighting for women’s equality. Single moms are special victims of austerity. Austerity will have a huge impact on senior citizens many of whom rely on Social Security as their sole means of support. Indeed, most of the 60 million Social Security recipients are barely making it and should get a raise, not cuts. It also should be remembered that this constituency votes and unless the Democrats want to give up the fight for the Congress, they need to repeal the “sequester” and drop the proposed “chained CPI,” which is nothing but a cut. I am disappointed that the Obama administration saw fit to make new concessions to the right that run counter to the spirit and the letter of the issues that won in the last elections. It is straining the unity of the broad coalition. Besides Social Security is not an entitlement. In 1935 when it was passed, the life span for the average person was only 61.7 years and most people of color were not included in the system. Today the average person lives about 14 years after reaching 65. African Americans live only 10.1 years after age 65. Black men on average survive only to age 72. After paying into the system ones entire work life the average person only gets 14 years of Social Security and if you are a black man it’s only 7 years. Rather than cutting back on Social Security a more humane proposal would be to lower the retirement age and subsidize the benefits so that they are livable. Let’s “scrap the cap” on payroll taxes and stop playing with people’s lives. The fight would bring people together. As the troops are coming home, it’s time to transfer that money to human needs otherwise the economic crisis is likely to deepen. We must be among those organizers that are helping the millions to find their way to struggle. The sequester debacle and the vote on gun control does not mean all is lost. The battle ahead is clear. To move things forward, the labor and people’s multi-racial coalition that won the day last November needs to be in the streets in large numbers. Politicians, who align themselves with that coalition, including the president, have to present a legislative and political program that is worth fighting for and will unify. History provides a lesson in this regard: Roosevelt had to be pushed to accept the New Deal: Today we have to do the same thing: push. 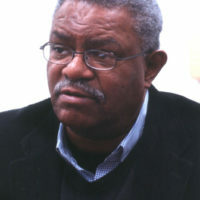 I agree with those like CPUSA chair Sam Webb who say we have to up the struggle ante. It’s already happening but it needs to be taken to a higher level. The larger labor and people’s May Day actions around the country and internationally are good indication of what is needed. With united action, the fight against austerity can be won. Stimulating the economy by increasing the buying power of the working class is key to a real recovery. 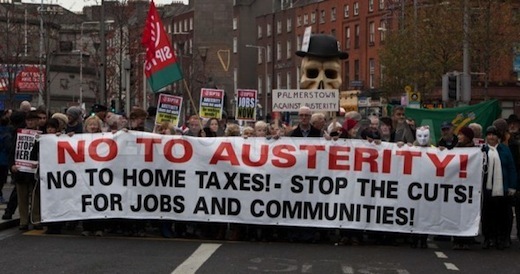 Photo: Demonstrators in Dublin march against austerity policies that cut health and education while bailing out banks and corporations with taxpayer subsidies (via ThinkProgress).